Create a report called Mmmm Donuts with a data source which connects to the Movies database. 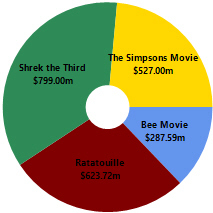 Add a dataset which returns the Title and BoxOfficeDollars for Animation films released in 2007. You'll need to apply filters to the GenreID and ReleaseDate fields. The GenreID for animation films is 11. Create a Doughnut chart to display the results in the dataset then close and save the report. You'll need to create an expression to display data labels like the ones shown here.